No China trip is complete without seeing the Great Wall. Today we will visit the Mutianyu Great Wall, the most spectacular section of Great Wall and less crowded. Drive back to downtown and pay an exterior visit to the Bird’s Nest and Water Cube at Olympic Green. The short visit to the Cloisonne factory gives a knowledge about Chinese porcerlain culture. Dinner of Quanjude Roasted Duck and then enjoy a fantastic Chinese Kung Fu Show. Today we do the sightseeing in the city center. We will see the historic Tiananmen Square, the majestic Forbidden City imperial palace; the Temple of Heaven, an altar temple where emperors held sacrifice ceremony to heaven for good harvest. Besides, you also have the oppotunity to learn Chinese pearl culture in the Pearl factory. No place is better to read about the Old Beijing life than in the Hutongs where Beijingers have lived for several hundred years. You are going to have a fresh rickshaw trip in the narrow allies and drop in at a local Hutong family. Transfer to Beijing Zoo to see the cute pandas and then go to the Summer Palace, a beautiful imperial garden. The Silk factory enriches your knowledge about Chinese silk culture. A fter the tour, be driven to the railway station to take an overnight soft sleeper to Xian. Our local guide and driver will meet yo at the exit of the train station. Start our exploration in this ancient capital. 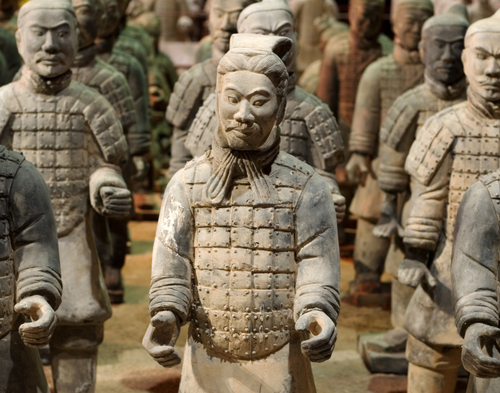 We will first see the most impressive Terracotta Warriors and Horses, the ‘underground army’from the first Chinese dynasty. Then have visits at the other historic landmarks, Xian City Wall and Big Wild Goose Pagoda. Depart Xian. We transfer you safely to the Xian airport for the flight back to Beijing. You could either fly back home or return your hotel in Beijing on your own. Thank you for using our travel service. Take care! *Train tickets: Beijing-Xian (based on 4 berths in a cabin; two berths deluxe cabin is available).